When board-certified plastic surgeon Scott R. Miller sought to upgrade the web presence of his award-winning San Diego practice, he called upon our team for a full website makeover. The result is a sleek renovation of his previous site design, complete with a user-friendly layout, custom-written content, and aesthetically pleasing features that all work together to shine a spotlight on the exceptionality of himself and his patients. The natural-looking results characteristic of Dr. Miller’s expertise are showcased in patient-focused testimonials on the homepage, as well as in an expansive patient gallery, with his practice philosophy of safety, quality, integrity, and service serving as the central theme of the responsive website design. Individuals seeking information about treatment can easily find the answers they’re looking for with uniquely written content detailing every aspect of each aesthetic procedure, in addition to an up-to-date blog discussing hot topics in cosmetic enhancement. Tailored content marketing and search engine optimization strategies also work to push Dr. Miller’s services to the forefront of search query results, ensuring the Internet’s spotlight remains firmly pointed in his direction. Are you ready to take your practice’s website to the next level? 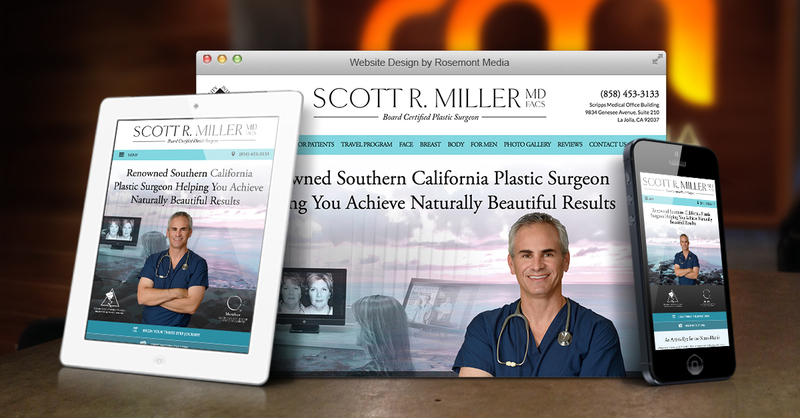 Explore the final results of Dr. Miller’s site transformation at www.millercosmeticsurgery.com and don’t hesitate to contact the team at Rosemont Media to learn how we can help you optimize your web presence.